Ce Morbic 12 a été construit par le chantier hollandais Ben Ullings. Sa construction est terminée, y compris mât et espars. La coque est prête à recevoir les couches de peinture de finition de la couleur au choix de l’acheteur. La suite en anglais…. 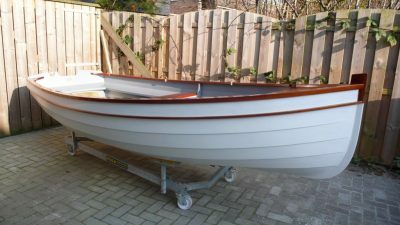 She is built with Bruynzeel Oukume First Grade Marineply. The wood for gunwales, thwarts, etc. is mahogany. Mast and spars are made of Yellow Cedar, which is very light and strong. The helm is made of ash. 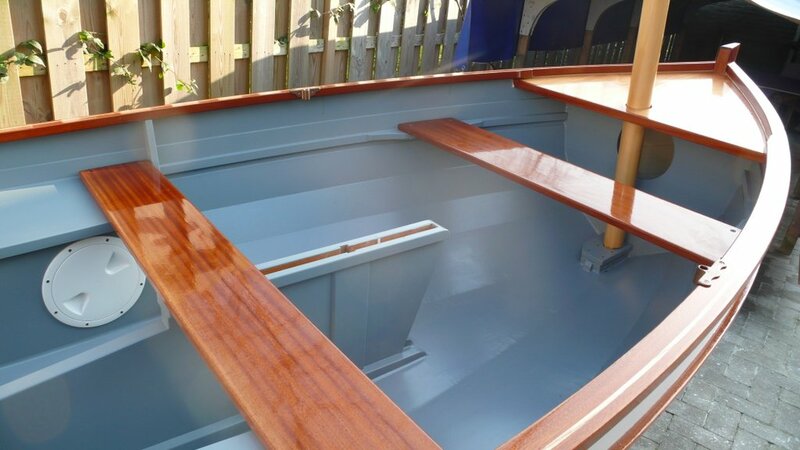 Sole and garboard are epoxy/glass sheeted. She comes with 2 bronze rowlocks and 4 bronze sockets. Rudder gear is also bronze. There are three buoyancy compartments closed with watertight hatches. Mast, spars and wooden parts are already varnished. The hull has two layers of primer inside and out. You only need to give her the colours you want. She comes without sail, blocks, ropes and extra fittings. It is also possible to order this Morbic 12 ready to sail. In that case the price is 9 600 €. Both prices are without costs for transportation.